Android Pay - Fast mobile payments in-store and in apps with most Android™ devices already available. Apple Pay - The easy, secure and private way to pay in stores, in apps and on the web. 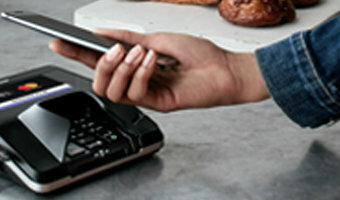 Samsung Pay - Pay almost anywhere you can swipe or tap your card. Whether you're grabbing a quick lunch, picking up groceries or shopping for clothes, use your Washington Financial Bank Mastercard in your mobile device to pay at millions of store locations. *Certain terms, conditions and exclusions apply. To learn more about Zero Liability, visit mastercard.us/zeroliabilty. **Masterpass tokenization dependent on the merchant. Apple Pay works with iPhone 6 and later in stores, apps, and websites in Safari; with Apple Watch in stores and apps; with iPad Pro, iPad Air 2, and iPad mini 3 and later in apps and websites; and with Mac in Safari with an Apple Pay enabled iPhone 6 or later or Apple Watch. For a list of compatible Apple Pay devices, visit support.apple.com. Apple, the Apple logo, Apple Pay, Apple Watch, iPad, iPhone, Mac, Safari, and Touch ID are trademarks of Apple Inc., registered in the U.S. and other countries. iPad Pro is a trademark of Apple Inc. Samsung, Samsung Pay, Galaxy s7 and Samsung knox are trademarks or registered trademarks of Samsung electronics co., Ltd. Other company and product names mentioned may be trademarks of their respective owners. Screen images are simulated; actual appearance may vary. Samsung Pay is available on select Samsung devices. Android Pay is compatible with NFC and HCE-enabled devices running KitKat 4.4 and above. Learn more at android.com/pay. Android, Android Pay and the Android Logo are trademarks of Google Inc.